We felt excited to see our APE Piling plant come to life like never before. For the first time ever we opened the doors of our pile manufacturing facility to the public, and invited guests from across the Americas to join us in a festive and fun open-house factory tour. Nearly 100 esteemed guests from around the U.S. as well as Canada, Mexico and South America took part. We were pleasantly surrounded by veterans of the industry, as well as new pioneers venturing into foundation construction. One of the biggest attractions people enjoyed was the live demonstrations of our HD drivers installing our piling products and using our drill bit tools in the field. We premiered a completed working model of our composite pile (the perfect foundation solution for power lines and utility towers of all kinds), installed two grouted piles, used our down-the-hole hammer bit to break apart tough underground geologies and pre-drilled a 20-ft hole using our pre-drill bit within minutes. One of the benefits that caught everyone’s eye was how fast the HD Drivers could use the clamps to release a pile or drill bit and quickly grab and insert another tool into the driver’s hex-head socket driver interface. At its heart, we showed that the excavator-mounted HD driver solution by APE Drilling is fast. Very fast. And efficient, too. It’s a simple, user-friendly, no-nonsense solution that the industry has needed for a long time to help one solid purpose: get the job done right, safe and fast the first time through. As always, Texas prides itself (as it should) on doing a very important thing right: barbecue. We enjoyed a fantastic lunch and delicious array of country cooking from our catering friends, Dream Events, followed by smooth but sensational musical entertainment from the Jon Young band. One key premiere that took place during lunchtime was a special speech presentation by Robert Fern from Texas AirSystems. He graciously provided his time to show our guests the details and benefits of our new geo-exchange foundations, which are solid steel foundations for buildings and structures that double as a heating and cooling system, using the underground temperature in the earth to balance out the temperature of clean water in a ground loop system. This provides economic and stable heating and cooling for building interiors. The most successful example of this happens to be our APE Piling building itself. 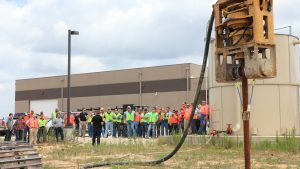 “No experience necessary,” could have been our slogan for the HD drivers, judging by how easily never-before participants took to the excavator controls and were able to drive our 20-ft HD starter piles. As an added and innovative bonus, guests were able to try installing piles and see our mobile mast product in virtual reality. Using cutting-edge VR headsets to immerse themselves in virtual jobsites and install piling with every bit of realism as, well, reality. We’ve found that genuine hands-on experience helps our clients see just how user-friendly we’ve designed these systems to be. Anyone can truly use them. At every event, we’re privileged to meet extraordinary people doing incredible things in the construction industry. Contractors are forming new ideas and creating innovative designs to tackle and eliminate age-old problems. Since we introduce new technology into the market, we also get the chance to hear the new methods and products that are working to help create a better world and better infrastructure. 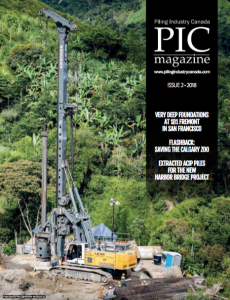 Much to our gratitude, APE Drilling products and APE Piling solutions are among the list of fast-paced, reliable foundation technology that the crews are raving about. We get excited about every new opportunity to meet new professionals, new friends, and to help create a greener and better world. A sincere thanks to all our guests who joined us at our open-house event. We look forward to venturing with you onto even more amazing foundations for the future of construction projects. See you in the field.